A new important member for Origine Group, that reinforces its presence in Chile with the leading company Copefrut, whose admission has already been approved by the Board. The Chilean company, set up in 1955 as Cooperativa Agrícola y Frutícola de Curicó and renamed Copefrut S.A. in 1992, exports fruits in more than 50 countries, and processes 150,000 tons of fruits, of which 15,000 tons of kiwis, 20,000 tons of cherries, 2,000 tons of pears and 90,000 ton of apples, in four different processing plants. Copefrut headquarters are in Curicò, capital of the Curicò Province, in the Chilean regions of Maule. Copefrut has also recently opened a logistic and commercial platform in the Chinese province of Guangzhou, in order to give a better service to clients in that market. Copefrut joins the other leading Chilean company David Del Curto, that has been member of Origine Group for more than one year. 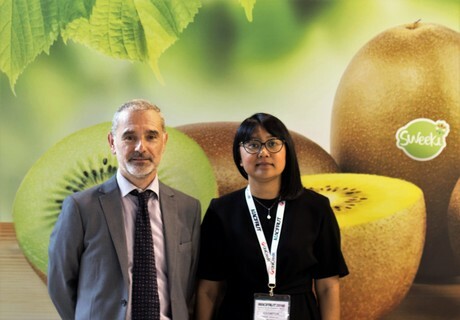 "Origine Group is an important strategic choice for us, - says Marco Echenique, Copefrut Sales Manager - aimed at increasing the value of our top quality kiwis with an internationally recognized brand. This is possible only by getting together with other companies and concentrating the resources necessary for a successful international marketing. The value of the companies that participate in Origine Group gives us confidence that we made the right choice." The Managing Director of Origine Group, Alessandro Zampagna, states that the new Chilean member will strengthen the offer of the Group, that aims at supplying top-quality kiwis 12-month-a-year for overseas markets. “Copefrut is a very important company, one of the biggest Chilean exporters, together with David Del Curto. Now our production base is more substantial and enables us to carry out more effective commercial strategies on the overseas markets. Furthermore, the considerable membership of Origine Group, recently reinforced by the entrance of OP Minguzzi, is an opportunity for commercial projects on other products besides kiwis and pears”.